The Hamilton Women's Housing Planning Collaborative aims to draw attention to the issue of homelessness and access to housing for women. Each month in Hamilton, more than 300 women are turned away from the city’s over-capacity homeless shelters. A group of community workers says that number is too high and something needs to be done. 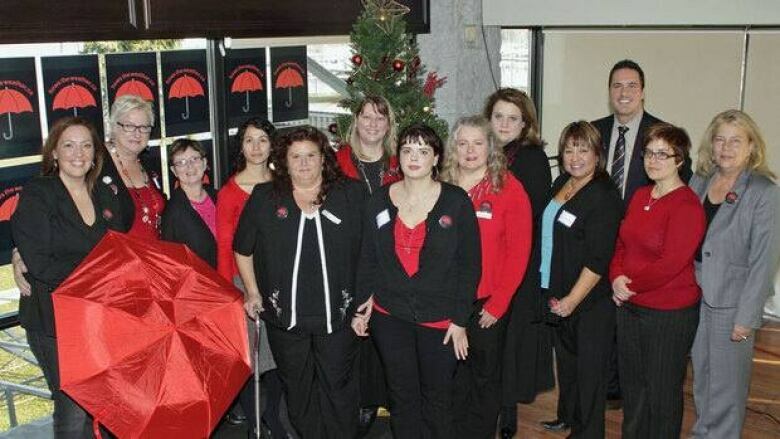 On Thursday, the Women’s Housing Planning Collaborative gathered for the launch of its How’s The Weather campaign, which aims to draw attention to the issue of homelessness and access to housing for women in Hamilton. The campaign supports all women facing homelessness in the city, and Aboriginal women make up a large portion of that demographic. Linda Ense knows all too well the struggles that aboriginal women can face in Canada. Born and raised with eleven siblings on Six Nations near Brantford, she witnessed alcoholism and family violence in her community. "Back then, there were no shelters. There was no where for us to go," she explained. Ense serves as the executive director of the Native Women’s Centre in Hamilton, which offers housing and programming for all women, with a specific focus on Native families. Now, she helps Native women find solutions and overcome the obstacles set before them. "When you see one of our women who has lived with homelessness, lived in a shelter, moved on and is now working, that is the best part," Ense said. "You see that resiliency in our women and you see the beautiful growth and empowerment." Laura Babcock, president of Powergroup Communications, helped come up with the idea for the campaign. "Canadians talk about ‘how’s the weather?’ all day long; it’s what we do," Babcock said. "I want them then to think about how that question would affect them if they were a homeless woman in Hamilton." The aim, Babcock explained, is to increase awareness and action from the Hamilton community. Whether that means lobbying their city councilor to make a bid for increased funding or donating their time to a local shelter, Babcock said the goal is simply to get people thinking about how they can help. There are more than 7,000 Hamilton women at economic risk of homelessness in Hamilton, according to the Social Planning and Research Council, because they are spending at least half their income on rent. Went you take into account the number of women who aren't visibly at risk — those staying with friends or family to get by — the number jumps even higher. Of those women, almost twice as many have Aboriginal ancestry than the general population of women in Hamilton. Ense also noted that Aboriginal women have unique needs and points of view. "Our people suffered the effects of colonization, residential schools and the 60s scoop.… We’re still dealing with those issues," she explained. "One of the things we lost was our culture; it’s so important to teach about some of our ceremonies because they’re healing." She said having a centre geared to the needs of Aboriginal women allows them to transition into the wider range of services across Hamilton, creating a community of women helping women.